dnerra: Hmm, I am not sure about the result after Black enters at the square-marked stone instead of Black 29. If White presses with the usual knight's jump, and Black chooses the usual joseki, we have a white wall facing black thickness. But White is first to get an extension, so this favors White a little. JamesA: Really interesting game! Black 29 is a difficult move to decide upon. How about playing 1 below, to extend from the top right shimari. 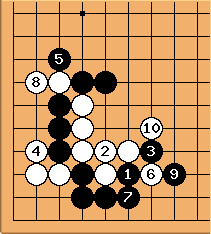 Then, if White makes a shimari in the bottom right Black gets a fantastic move at m - preventing White's extension and also creating a double wing enclosure. However, looking at this position I think Black may have a difficult game (White has sente), so 3-3 may be the way to go (Black gets territory and White's thickness isn't too valuable because of Black's opposing thickness). The problem is that White has quite a bit of territory already and his stone on 5-3 in the bottom right makes it difficult for Black to get compensation with his thickness. I'm worried about the territorial balance for Black after White 28. JoeSeki White 30: nothing else even looks good. I'll take the profit. I think if I had Black I would have played at the 3-3 point and taken the profit away from White. Any outside influence White gets won't be that beneficial, I think. I considered all left big points left (oba) at j, k, m: I had really a hard time making my mind up. For some reason I thought the left side uninteresting, and that it was no good entering at x (White 30) just to be pressed at 29 (but maybe I am wrong in thinking this??!?). AvatarDJFlux: If we're giving each other a headache it means that the game is difficult for both: excellent! Leaving jokes aside, I perceive this fuseki as really challenging. A difficult fuseki is for me one of the most beautiful elements of go. JoeSeki I considered this sequence thinking my stone in the lower right corner being on the 3-5 point might have a good relationship with my stones crawling out. Not only would I get out into the middle but I don't think the thickness you get wouldn't be worthwhile. But after thinking about it a bit longer I decided I'd rather not strengthen you this way on the lower side. If you want to stop me from getting out into the middle you'll have to take gote again anyway. So I believe (probably incorrectly ;) that the middle will be unimportant in this game, so by not giving you more thickness by forcing my way out with crude moves, I should be able to handle the lower side better. Thus, you were very insightful to play for me as you did. It is as I would have played. Thank you. unkx80: Don't mind if I ask, why is there two move number 4s in your diagram? JoeSeki Whoops poor editing my part. I fixed the diagram so it makes sense. Now our comments here won't though. I am back from Holiday and had a great time. I went to a gaming convention, and bought some new games to play with friends. Taught someone how to play go, and hopefully hooked them on it :) I had no time to think about my next move though. I was thinking about the sequence below and hadn't gotten around to the move I should make once I had sente. Hmm, where is the important point to play? The top is 12 lines of separation between a black group on the fifth line and a white stone on the fourth line. Wide and tall. The right is 11 lines between a black stone on the third line and a white stone on the fifth line. The left side is between a white stone on the third line, and something seven spaces away. But I don't know what that will be in the middle game. Is that blackness down there or whiteness? Trying to fight my way out would make it blackness. I think the top is the biggest area. But what kind of shimari? Fourth line? I don't think so, A high stone is not called for here I believe. So third line. [Small|[3453 enclosure]) or large knight's shimari? Small allows me to extend a nice two spaces should you extend along the top. But then again the right side seems bigger then the top after my shimari. So a large knight allows me to extend two spaces along the top even further, making any extension by on the top awkward. On the other hand, if I start to enclose both of my corners you get a double wing formation working for you. That can't be good. Tough, very tough. Or is that wrong thinking? I'd have three corners and could cap both extensions (or invade under them if on the fourth line). I should be able to reduce such a double wing formation. Right? I think this is a turning point for White. I'll get you a move by tomorrow. I hope my rambling wasn't too incoherent. As far as I know, this is the only way of having a reasonable outcome in this game once you started the Nadare. JoeSeki I think you chose wisely here. I was inviting the fight by taking the avalance joseki. My stones are poised wonderfully for a fight. Which is why I said earlier that if you were going to avoid a fight, you should have avoided the large avalanche all together and played Black 13 at 18. JoeSeki White 24: At least I end with sente, I think I'll spend some time thinking about what I'll do with it. I'm away for the July 4th weekend.